5 minutes from town and therefore close to all Pigeon Forge attractions, restaurants, dinner shows, shopping, events, etc. 15 minutes from Gatlinburg, Glades Road Arts & Crafts District, Ripley's Aquarium, Ober Ski Resort, and Smoky Mountain National Park, mini-golf, shopping and a myriad of other attractions. Easy and accessible driving roads to cabin. Large private driveway can accommodate 3 cars and is motorcycle friendly. Cabin sits on 1/2 acre leveled yard. Perfect for children to run and play in! Playground for kids in resort complex. About the cabin: Making Memories Too provides a 'home away from home' feel. It is beautifully decorated two-story cabin with no detail spared! The cabin features 2 bedrooms with queen size beds, a bonus room (like a den) featuring a day bed with trundle which sleeps two. It is perfect for a children's room. There are two full bathrooms, one upstairs and one downstairs. A pool table/game area is located in the upstairs loft. There are a total of 4 TV's in the cabin. The kitchen is fully stocked with pots, pans, dishes, glasses, silverware, microwave, and coffee pot. Outside, the cabin has a convenient wrap around deck with a hot tub for 6 people, a gas grill, picnic table, and rocking chairs to sit and enjoy the natural surroundings. The cabin sits on an almost 1/2 acre leveled yard, perfect for the children to run around in! Three cars can comfortably park on its driveway. Nearest city: Pigeon Forge: Barely five minutes away from the excitement, shopping and superb attractions of Pigeon Forge, including the world - renowned Dollywood/Splash Country, Titanic, Dixie's Stampede, Black Bear Jamboree, Wonderworks. Plus a myriad of dinner theaters; such as, The Miracle Theatre, The Comedy Barn, & Tennessee Shindig. In addition, other attractions such as horseback riding, zip lines, mini-golf, white-water rafting, and go-carts. There are many restaurants and shopping, including the famous Christmas Place and Tanger outlet stores. Gatlinburg: About 15 minutes away is the world renowned city of Gatlinburg! Gatlinburg is adjacent to the Smoky Mountain National Park. It is a picturesque city with many attractions, shopping and restaurants. The attractions include the famous Ripley's Aquarium and other Belive It or Not museums, theaters, and attractions. It is also home to Ober Ski Resort, various ski lifts and the Arial Tramway to enjoy the mountain sights and ski resort. Plus various mini-golfs are found here. 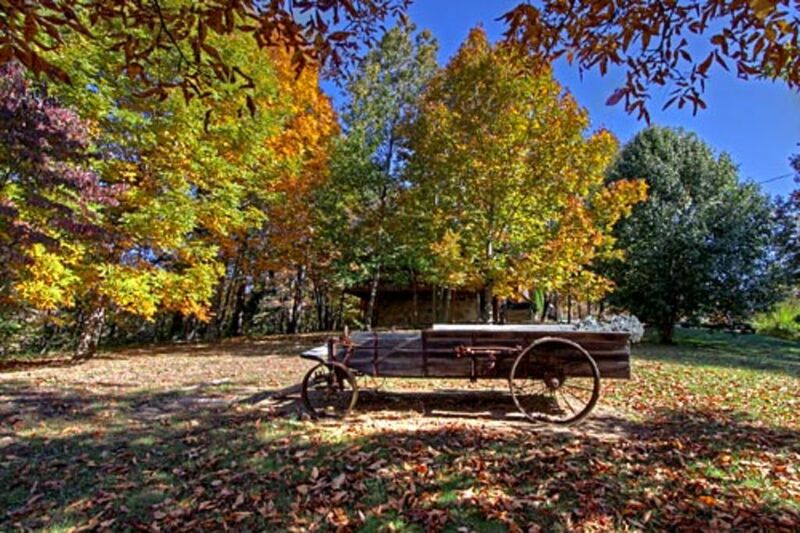 Many outdoor activities like horseback riding, hiking, zip lines, snowboarding, camping, biking, rafting, birdwatching, and leaf season are part of the many activities enjoyed in Galinburg and in the Smoky Mountains. The great Smoky Mountains Arts & Crafts community is located in Glades Road. Tennessee artists offer original handmade treasures for your home. The restaurants hold a myriad of dining choices from home cooking to recipes from around the world. Our names are Jose and Mercy. We live in Pembroke Pines, Florida. Our two children are JR, 23 and Lauren 17. Jose is a custom Kitchen designer and consultant who has been in the industry for over 23 years. Mercy has been an elementary school teacher for over 20 years. JR will soon graduate with an engineering degree and Lauren is now on her 1st year of college. In 2006 we took a family trip to Pigeon Forge for the first time. We instantly fell in love with the area, its people, its beauty, and its serenity! We loved the cabin lifestyle and knew immediately that it would be our dream to own one. So during that summer, we began our search. We must have visited over 50 properties! 'Making Memories Too' was 'love at first sight!' It took us over one year to find it but in September 2007, we made it our own. 'Making Memories Too' is special because of its unique location. It is close to town. We are near the Pigeon Forge Parkway where most attractions are found and down the street from Dollywood's service entrance and the Gatlinburg Golf Course. The city of Gatlinburg is only about 15 minutes away! But, we are also far enough from the 'hussle and bussle'. This allows for the privacy and the closeness to nature one desires when visiting the Smoky Mountain National Park. Our favorite activities while visiting are hiking, snowboarding, white water rafting, zip-lining, and enjoying the area's diverse wild life and unique plant life. The cabin also sits on a 1/2 acre leveled lot which affords it ample parking and usable yard space. The kids just love being able to run around and play games on its yard! The cabin itself is like a 'doll house'! It has a wrap around deck, allowing total enjoyment of its natural surroundings while barbequing, or enjoying a dip in the jacuzzi, or just quietly rocking on its many rocking chairs or swing. The interior is spacious but cozy. The layout is perfect to allow privacy while still enjoying a family gathering. The kitchen is fully stocked and ready for the challenge of even a Thanksgiving dinner! It is truly the perfect place to make lasting memories, thus its name 'Making Memories Too'. We visit often and truly love spending time at our home. It is truly magical! Our goal is to share our joy with our guests in the hope that you, too, make memories that last a lifetime!!! Located at the foothills of the Smoky Mountains. The cabin has a forest view. Property sits on 1/2 acre leveled yard. Wrap around balcony with rocking chairs and a swing. Gatlinburg Golf Course located 3 miles from property. This is a fully stocked cabin and includes all of the comforts away from home. Wireless Internet provided! Loved the cabin, great location, owners very nice, and quick to reaspond with any questions we had!! It was clean, and love knowing they actually empty and refilled the hot tub after each stay!! Will definitely stay again!! We had a great time staying here. It is only minutes from Pigeon Forge and close to Garlinburg too. The kitchen is stocked with all the extras so you don’t have to worry about bringing that stuff from home. We didn’t spend too much time in the cabin because we were out and about but this was a wonderful place to come home to at the end of the night. The kids loved the TVs in each bedroom. The property was beautiful! Perfect for our family of 5. The Cabin was very nice and comfortable. The TV's in the bedrooms did not work. Other than the TV's not working in the bedrooms, the cabin was nice and clean, comfortable. The TV's and cable boxes have been since replaced and upgraded. This is the perfect cabin for a family getaway! Enjoyed our stay. Location was very convenient with paved roads leading directly to house located first home in nice subdivision. The home itself has plenty of room for small family, although bedrooms are very small. Nice open floor plan. Nicely furnished. Very comfortable beds and furnishings. Pool table was added bonus although the space is too small to actually play pool and the legs were loose, but it is just for fun. The cabin could use better lighting especially in the bedrooms. Seemed dark even in daytime. Maybe additional lamps. especially in downstairs bedroom. The owners were very helpful and seem to care about the comfort of their guests. Very great experience with them. Changed one of our days with no problem. Overall, a nice, pretty and comfotable log home and we enjoyed our stay. Nestled in the foothills of the Great Smoky Mountains, surrounded by truly majestic nature and endless skies, is our private log home. It is situated on 45 private acre resort estate located between Gatlinburg and Pigeon Forge, in Tennessee. Barely five minutes away from the excitement, shopping and superb attractions of Pigeon Forge, including the world - renowned Dollywood, and only 15 minutes away from Gatlinburg, home of Ripley's Aquarium of the Smokies and a myriad other attractions. Our cabin is an oasis of tranquility. To access cabin: From the parkway heading south, make a left turn at light #8, then a right turn on Dollywood Lane. Dollywood Lane will become Upper Middle Creek Road. The cabin will be approx. 3.2 miles inside the Country Pines Log Home Resort (Look for sign on right hand side of road). Making Memories Too will be the first cabin on the left. Rates are subject to change. Holiday rates and time of stay may vary. We require a minimum stay of three nights during the regular season. However, we may allow a minimum stay of two nights depending on occupancy. Please contact owners for details.